Smith Point is located on the Southern side where the Potomac River enters the Bay. The first light at this point was erected in 1802. Erosion of the shore line caused the light to be moved in 1807. In 1821 a lightship was stationed off the point. In 1828 erosion again forced the Light-House Board to acquire more land at the point and construct a new tower. By 1853 records indicate that the tower was in very poor condition and the Light-House Board recommended that a screw-pile light be built off the point in the shoal area. Congress did not provide enough funds to build this screw pile light. In 1855 the old 15 lamp reflector system in the tower was replaced with a fourth-order Fresnel lens although is was noted that erosion was still a problem in this location. In 1857 a new lightship was placed off the point and in 1859 the light on the point was removed. In 1868 the lightship was replaced by a screw-pile lighthouse. This structure fared well until 1893 when the station was damaged by ice. Repairs were made but again on February 14, 1895 ice ripped the house from its piles and carried it down the Bay. Most of the items from the house were recovered including the lens and fog-bell equipment. This time Congress authorized up to $80,000 to replace the light station. A caisson lighthouse was chosen for the site. In July of 1897 the caisson was complete and work was begun on the house and the tower. The light was completed on August 5 and was accepted. The fourth-order Fresnel lens and the fog signal equipment from the old screw pile station were used in the new caisson lighthouse. In the early 1970's, an under water power cable was run to the light allowing the station to be automated. The cable was replaced again in 1988 when the old cable failed. In 1991 the Coast Guard performed a major overhaul of the lighthouse inside and out. 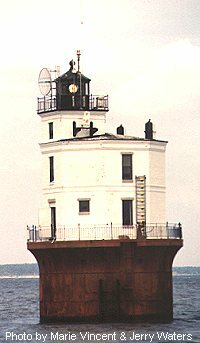 This lighthouse is best viewed from a boat, but it can be seen in the distance from some shore points.